This one last teaching is applicable to all three stages of life. Firstly, it is applicable to the ordinary man who does not believe in God. If he gets into the habit of finding fault with others then sooner or later the others will start finding fault with him. So if you want to be happy, even in an ordinary life, stop finding fault with others. It is applicable, if we go a little higher, to the devotee level. How can one devotee find fault with another devotee if both are devotees? No matter whether he is a Christian devotee, a Moslem devotee, a Hindu devotee or a Buddhist devotee, all are devoted to the highest that their mind can think of or see in their particular Ideal. Did not Sri Ramakrishna preach harmony of religion? So do not criticise. Recognise that the other person is also praying to the same thing: Satchitananda. The highest stage is that if I have realised the Self, I, the Self, appear as all this, I see myself in all this. The Self is in me and the Self is in all beings. When they asked the Holy Mother, 'What will happen to the other gods and goddesses [devas]?" Sri Sarada Devi said, "Nothing is wrong, they are all a part of Me.' She saw herself in them. The One has become many, so the many must be true too. The many becomes the One. Holy Mother's words are a great teaching. When God incarnates, when God comes to this Earth, He brings his chosen ones through whom He does His own work. The main thing is to accomplish the work. Swami Vivekananda was rightly born in a lawyer's house. His father fought many cases and like attracts like, talking attracts talking, explanation attracts explanation. His father, Vishvanath [Datta], explained the laws of this world to his son; and Swami Vivekananda himself was later to know the laws of the Universe? Does not the seed grow in the soil that is conducive to its growth? I am sure that as a lawyer the father must have explained the law and many other things to him. Swami Vivekananda always liked to enquire into the truth of the matter, just as lawyers like to enquire into the truth of the evidence. A lot of lawyers enquire only into a portion of the evidence but make it appear true. In this case it was just the opposite. Whatever Vishvanath did he enquired into the whole truth of the matter and Swami Vivekananda learned this characteristic from him. Taken from Mother Radha's notes, written at Swamiji's feet. Ramakrishna did not want a 'bread-winning education.' He wanted that Knowledge, knowing which you know everything else. Master [Sri Ramakrishna] had the knowledge of who we really are, and how we can live in peace with ourselves and with the whole Universe. Scholars think they are the greatest and that they will reduce the world to dust and dirt with their theories. Philosophers think the same, as do theologians, and atheists. Like other Incarnations [Avatars], this son of the world came to deliver this message that is very, very old, but is new to us today. Sri Ramakrishna's message to the world is very, very simple; but to explain this message he spoke in parables. His whole message is: "Know your Creator - know from whence you come, your purpose in the world and where you are going." When a man has no answer to these questions, he is puzzled. Even a child can get the highest benefit from this message. God must be for the literate, for the illiterate, for the rich, for the poor, for the learned and for the unlearned. This fits Sri Ramakrishna to the T [i.e. perfectly]. You must lead a life going towards God. Your first duty is to become God-conscious. Swamiji Vivekananda said, 'Each soul is potentially divine,' and the purpose of all the religions in the world is to manifest that divinity in us. Today, are we manifesting divinity or not? Or have we gone back to the animal kingdom where the fittest survive? Taken from Mother Radha’s notes, written at Swamiji’s feet. It is not for nothing that Sri Ramakrishna is known as the embodiment of all the deities of the past, present and the future. You may not understand the term ‘the future’ but in our scriptures, in the Devi Mahatmyam and the Bhagavatam, it already describes which Avatars [Incarnations] God will take in the future, what form the Lord will come in. So in the future, God Himself will have to come. What I am trying to say is, do not under-estimate Sri Ramakrishna. Towards the end of his physical life Sri Ramakrishna was suffering from cancer. God in human form suffers too, Christ suffered too. If Christ did not suffer, then we would not know how to suffer. 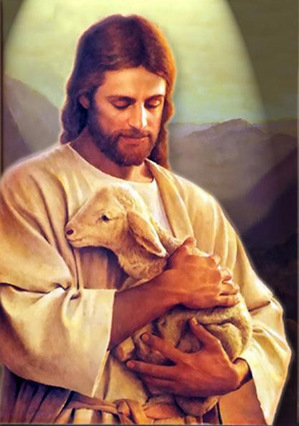 He suffered and taught us how to become above suffering. How? By relying on God Himself. That is what the Lord taught us. And Sri Ramakrishna is like that too. One day when Master was suffering from cancer, he could hardly speak and he was dozing. For a few moments the Master went off to sleep, so the devotees, who were looking after him, decided to go off and have a little rest in the garden. They sat under the trees here and there and chatted. Sri Ramakrishna, the Incarnation, said, “The ordinary guru gives you information - but a guru like Jesus Christ transforms your life.” The transformation takes place within and you will manifest the highest quality. Sri Ramakrishna would just touch somebody and say, “Ma, Ma [his name for the Divine Mother], wake up,” and they would be transformed. They would have a vision of God. Bande, Sithala, Kali [gods and goddesses] and others are still there in the astral. Question from devotee: In the astral body? Swamiji: Yes. Where is your mind? [i.e. where do you think it's located?] Answer from devotee: I do not know. Swamiji: [touches his body in different places and says] Here, here, here. So they are in the astral - what is called hiranyagarbha, cosmic mind. If you worship Sri Ramakrishna now, you have worshipped him and Rama and Krishna before, in different incarnations. It is the same Incarnation that is in Sri Ramakrishna now. The secret of sadhana [spiritual practice] is the sincerity and purity and love with which you do it. You must do sadhana and also read the words of Master [Sri Ramakrishna, contained largely in 'The Gospel of Sri Ramakrishna]. Chew his words over. There is no fruit without a tree - for example it is no good reading Swami Vivekananda etc. without reading their source. If you chew it over, this is your real sadhana. This will revolutionise you. The ordinary guru is for you and me. An Avatar is for the whole universe, regardless of dharma [path, religion or belief system]. An Avatar comes to show humanity. Sri Ramakrishna came and liberated all dharmas - not my or your dharma only. Avatars also have great spiritual power. Sri Ramakrishna touched Vivekananda’s chest and said, “Wake up, Ma [Divine Mother - female aspect of the Universe] [Jaago ma].” With this Vivekananda got into an ecstatic mood and saw his Ishta Devata [chosen Ideal or Deity]. Jesus Christ said, “Behold!” and straight away they saw It. Sri Krishna said, I embody myself with My maya. Who is the greatest yogi in Hinduism? Ravana. He spoke to Yama, the Lord of Death. He spoke to the Sun and it would stand still. Power corrupts. Patanjali said: Yogic powers are not spiritual, they are obstacles on the path of God-realization. 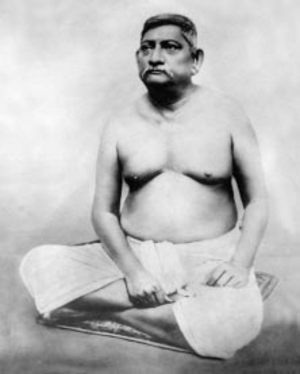 Sri Ramakrishna said to Vivekananda, “I have the eight siddhis [psychic powers] and I want to give them to you.” Swami Vivekananda said, “Will they give me God-realization?” Master said, “No, but they will help you in the world.” Hearing this Swami Vivekananda wasn’t interested. Siddhis have concentration but not purity. A high desire is for God; a low desire is for the world. If you use the Gayatri mantra in a certain way, at a certain time it leads to powers. If you use it in a certain way, at a certain time it leads to God-realization. Besides these daily readings Mother Radha recorded many hours of our beloved Swamiji speaking. There are currently 40 different CDs available in sets of 10 for R200 per set. This price includes postage. Please email timhoare@webmail.co.za to order. In meditation take your Ishta Devata [chosen Ideal/Deity], put it in your own heart and worship it. If the blessing of God comes on us we will be changed people. When this does not happen then something is wrong with us. An Incarnation has not come for this or that individual but for the good of the whole world, to give knowledge to the whole universe. When there is spiritual language of the heart there is discrimination of the unreality from the Reality. Touch the philosopher’s stone and everything turns to gold. But when God touches anything it turns to Soul. In man’s body the spine manufactures ojas [vital force]. In animal bodies it is not like that. The Incarnation embodies in Itself the grace of God - in the form of His teachings. He has taken birth in this age, as Sri Ramakrishna. Master cures the diseases of the mind. That is something divine and people start to worship it. Sri Ramakrishna indicated that Bhagavan [God], bhakta [the devotee], Bhagavatam [scripture] are the same. Tulsidas [the recorder of the epic Hindu Ramayana] depicted Rama as Divine. Before that people thought he was just a great man. There is no mistake in these histories. The Rishi [sage] wrote and edited it himself and his sons recited it in front of Sri Rama. If there was a mistake Sri Rama would have called it lies. But it is written and it is correct. 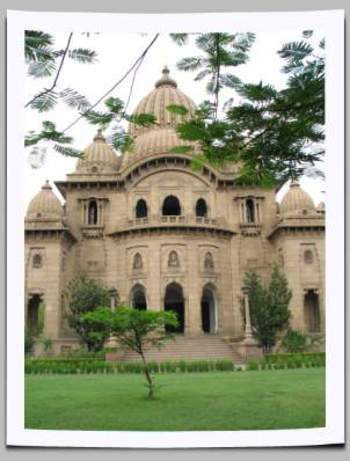 Sri Ramakrishna became his own author. 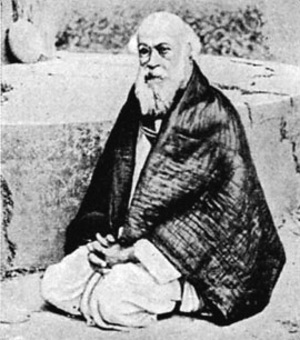 He would call ‘M’ [Mahendranath Gupta - pictured, the recorder of ‘The Gospel of Sri Ramakrishna’] and ask, “What did I say yesterday?” Then he would say, “No, no, I said this . . .” and he would correct it. This led to the Gospel of Sri Ramakrishna. It is necessary for God to go on writing His own history because man will project his own personality. The writer is not separate from God. He must be God to understand the secrets of His mind. 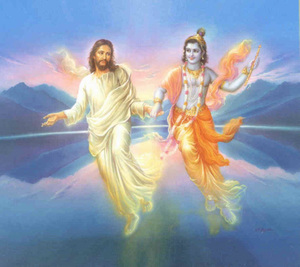 So first we worship the Rishi [sage/saint] and then God. First we worship the light and then we worship the object of the light. The song says: Give me purity of body, mind and soul. Give me understanding to understand the knowledge you left behind. Give me bhakti, devotion. This cannot stand on its own, it must have faith behind it. Man has no knowledge of God, he worships God only. People are still trying to recognise Sri Ramakrishna, to analyse Sri Ramakrishna, but he makes us feel inside what he is. Man gets attracted to an Aspect of God because he cannot be attracted to the Absolute. May you be blessed. It is the guru’s grace that has dawned on you in the form of this birthday.